ECFanGrid: Built-in redundancy, Compact and Flexible. ECFanGrid is a multiple fan array for Retrofit and New AHU application. Equipped with our exclusive, energy efficient and easy to control EC Motor technology, Rosenberg’s ECFanGrid is our approach to improve reliability, flexibility, and simplicity in existing or new ventilation systems. As a Property Owner, Manager, Contractor, or a Specifier our modular concept provides a cost-effective HVAC solution. Please choose your category below to find out more. The ECFanGrid retrofit kit is a ‘plug and play’ AHU solution that reduces the installation time and labour on your retrofit project. Rosenberg’s ECFanGrid kit includes the fans, a grid layout, inlet cones and cone plates, mounting supports to create a structure, sheet metal fill plates and all of the assembly hardware. We offer a pre-assembled Control Cabinet complete with circuit breakers and an additional 24V power supply that saves time on-site. An ECFanGrid consisting of several smaller fan units is designed to replace a large single fan. Components are small enough to easily move through existing doorways. No need to rent expensive equipment like a crane. On some projects, it is possible to install an ECFanGrid while the single original fan is still operating. you need to ensure that the installation and commissioning of the ECFanGrid is a well-managed process. 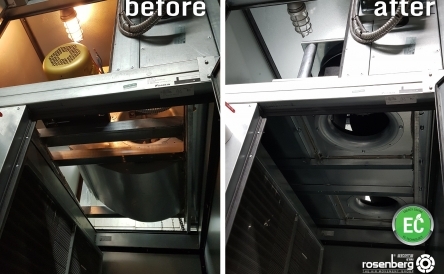 When an ECFanGrid is installed in an AHU or HRV interior space is gained, inside the cabinet that allows easy access for service personnel to do preventative maintenance or replacement of modules. Energy Efficiency Upgrades. The ECFanGrid is an array of fans each capable of variable speeds. Use your building management systems or control automation equipment to vary the fan’s speed on demand. For energy audits and retrofit incentives are available for your customers, check our interactive map for your province to see where funding is available for engineering, modeling and consulting. EC Motors are the most efficient motors in the market for energy savings. ECFanGrid is often more compact and lighter than a single large blower. Easy Wiring & Compatibility with Building Management Systems The ECFanGrid performance is controlled by external signals. Setting it up is easy and does not require complicated software or control architecture. It can be easily interfaced to your existing building management system. The ECFanGrid Kit is a pre-engineered comprehensive solution that provides all the parts needed for a successful AHU installation project. An ECFanGrid consisting of several smaller fans is designed to replace a large single fan. Components are small enough to easily move through existing doorways. No need to rent expensive equipment like a crane. An ECFanGrid consisting of several smaller fans is designed to replace a large single fan. If one fan in the grid fails the others will increase speed. The result is no downtime due to failures. The ECFanGrid retrofit kit is a ‘plug and play’ solution that reduces the installation time and labour on your retrofit project. Rosenberg’s ECFanGrid kit includes the fans, a grid layout, inlet cones and cone plates, mounting supports to create a structure, sheet metal fill plates and all of the assembly hardware. We offer a pre-assembled Control Cabinet complete with circuit breakers and an additional 24V power supply that saves time on-site. EC Motors (ECM technology) are the most efficient motors in the market for energy savings and energy-efficient buildings. ECFanGrid is often more compact and lighter than a single large blower. Easy wiring and compatibility with Building Management Systems The ECFanGrid performance is controlled by external signals. Setting it up is easy and does not require complicated software or control architecture. Rosenberg’s ECFanGrid is an innovative design HVAC solution for manufacturers of air handling systems. See how this strategy will improve performance, reduce sound levels, eliminate downtime and enhance your customer’s satisfaction with your equipment. We use our variable speed EC fans built with our external rotor motors to lower energy consumption across the whole range of operation. We meet or exceed the European energy standard ErP 2015, the highest in the world. Our EC fans qualify for Canadian and Provincial energy efficiency program grants, loans and incentives. The ECFanGrid delivers uniform airflow. This improves efficiency by reducing turbulence across heat exchangers and through filters. Our EC motors allow the ECFanGrid to be variable speed. Using control signals (0-10V or 4-20mA) from sensors or building management systems, the ECFanGrid will automatically adjust to changing conditions. Using control sensors automate your system to adjust for differential pressure, constant airflow, temperature, CO2, fault detection, emergency alarms and more. The smaller footprint of the ECFanGrid can reduce the space requirement for the fans by up to *70%. *(as compared to a single large fan) Reduce your costs to produce your equipment, reduce the customer’s space requirement for your product and free up space. Compared to traditional systems that use single large fans our ECFanGrid is lighter. This means less mechanical load on support structures and may reduce construction costs as well as equipment installation costs. The total sound power of the ECFanGrid is the same as other systems but the frequency spectrum is higher. Higher frequencies require smaller attenuators, which minimizes the space needed for the air handling systems. Some customers require extra capacity in their critical system applications such as hospitals, data centers, schools or other public facilities, The system design strategy that uses multiple fans, will provide your system with fault tolerant operation and eliminate downtime. 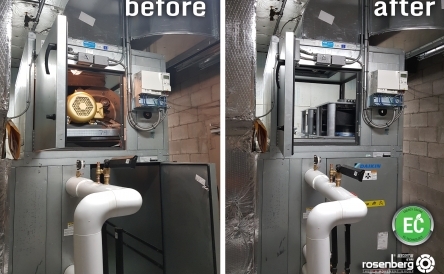 Systems can be designed to allow for service to filters or replacement of fans while the air handling system is running. Explore the cost-saving advantages and possibilities that multiple fan systems offer when customers ask for redundant fan systems. Rosenberg Fans Canada Ltd. has EC Fan inventory at our Mississauga, Ontario location. We support our OEM customers with dedicated inventory to minimize your delivery lead-time. Our EC Fans are CSA and UL listed and are available in sizes from 200 mm to 1,000 mm diameter, in different materials and voltages. The ECFanGrid assembled by Rosenberg is the only one of its kind using EC motors (ECM).This gives our grid unique advantages and benefits over those of other fan arrays using standard motors. From two to more than twenty fans either with our ready to use Unobox or ECFanGrid retrofit kit, we can insert our ECFanGrid into any existing enclosure in combination with our multiple fan sizes. Our ECFanGrid can deliver the air flow and pressure that your application demands. 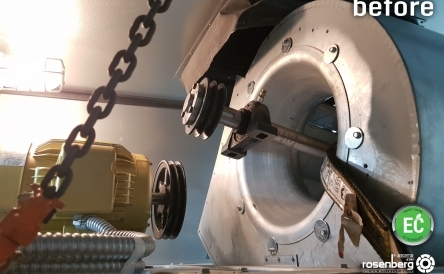 Retrofitting and designing ventilation systems with the ECFanGrid will accommodate smaller footprints compared to systems using the standard belt driven fans. The unique Rosenberg multi-fan array solution includes everything within our EC Fan Retrofit Kit required to make your next retrofitting project a big success using a single source. The Unobox is an assembly consisting of a backward impeller EC fan mounted inside a sturdy box. It is a Rosenberg’s approach to the modular construction of a grid as a standalone unit, or in a case when a previous casing no longer exists. Constructed out of an extruded aluminum frame with thermally and sound insulated galvanized steel panels. Powered by our energy efficient and easy to control EC motors. Simple and clean. Plug and Play. Drive – directing power electronically to different coils is what drives the motor, this makes the motor extremely efficient in the usage of energy. 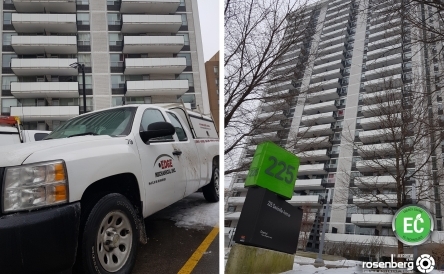 Power – Rosenberg motors can handle 120 V single phase, 230-460 V three phase and up to 600 V with our dedicated transformer for the Canadian market. EC motor powered fans are efficient, intelligent and versatile. Retrofitting with our ECFanGrid instead of a single fan provides reliability and redundancy as well as flexibility for any given ventilation system. If one fan fails the remaining units on the grid will pick up the lack of air flow. The fans will increase speed and hold at the desired setting until the fan is replaced. In critical applications where constant air flow is required, this feature offers a sound solution and much more reliability than a single fan, no downtime when failure or servicing. With our multiple EC motor and plug fan sizes, the Rosenberg ECFanGrid or Unobox are able to adapt to any type of grid depending on the geometry of your actual installation. The combination of impeller size and motors will provide the desired output on flow and pressure. 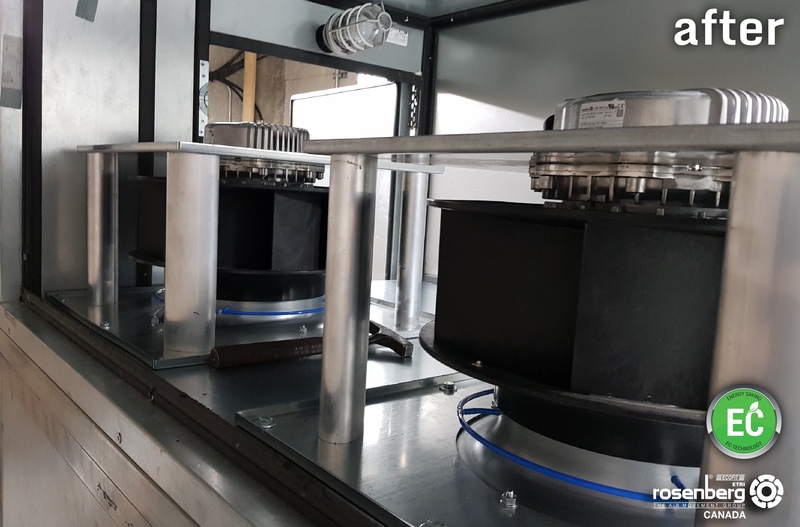 Due to the compact size and weight of Rosenberg’s ECFanGrid retrofit kit and Unobox, the fans are easy to move, lift, and place into difficult and complicated spaces. This is a huge advantage over larger and bulkier single fan retrofit installations where demolition, lifting, and special equipment is required. Rosenberg ECFanGrid retrofit kit includes: — our analysis on how to accommodate the grid; the mechanical performance calculations including electrical and power consumption; drawings and documentation; the required fans and inlet cones; adaptive structural supports for complete stability (top, bottom, side and between components); sheet metal fillers; complete wiring cabinet with protections and supplementary control power supply. Optional components include 600 V power adapter module, grills, potentiometer and local controllers with transmission capabilities and more. This is a one in all Rosenberg solution. Rosenberg's ECFanGrid is the most energy efficient HVAC system available on today's HVAC market. Our research team is constantly working on innovations. Our fans powered by motors with the modern EC technology achieve efficiency ratings over 90% and can save up to 50% in energy consumption versus traditional motor technology (in accordance to EC 60034-30) with energy rating greater than IE4. Electronically Commutated Motors (ECM) are not only efficient in their operation, but without the complications of a VFD (Variable-frequency drive) the embedded technology allows the motor speed to be fully controllable by different room variables, such as differential pressure, temperature, occupancy, time, etc. This allows the overall system to have an extraordinary precise energy usage allocation. Our goal is to provide our customers with all the tools needed for a successful retrofit project. 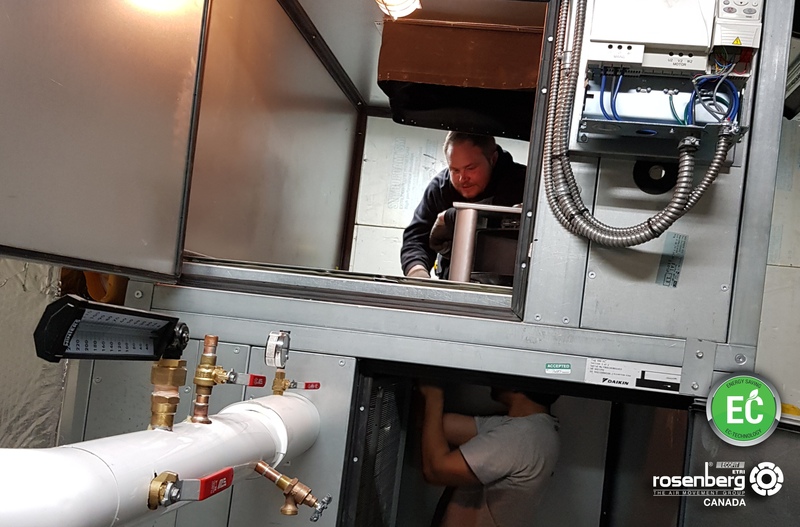 With our Rosenberg Retrofit Kit ,we deliver all the elements to fit the ECFanGrid inside the plenum of any existing AHU. LiveSmart BC Incentive and Rebate Programs are designed to empower British Columbia citizens, businesses and consumers to make smarter, greener lifestyle choices. The decision to take climate action may come in the form of behavior changes (modes of transportation, home utility usage), consumer choices (energy and fuel efficient products, home heating systems), or efficiency and conservation decisions (home retrofits, business upgrades). Rebates and incentives listed on their website are designed to decrease your energy consumption (electricity, natural gas, motor fuel) and help you enjoy savings from lower monthly bills. The Municipal Climate Change Action Centre (MCCAC) provides funding, technical assistance, and education to support Alberta municipalities in addressing climate change. The MCCAC is a partnership between the Government of Alberta, the Alberta Association of Municipal Districts and Counties (AAMDC), and the Alberta Urban Municipalities Association (AUMA). The Taking Action to Manage Energy (TAME+) program provides tools and funding to help municipalities understand how energy is used in their buildings, identify key savings opportunities, and implement retrofit projects. For detailed information on eligibility requirements, available funding, and how to apply, please refer to the TAME+ Guidebook. Save on Energy Retrofit incentives reduce project and operational costs for equipment upgrades – and open the door to new possibilities for your business. Whether it’s a lighting upgrade, motor and heating installations or new control systems, incorporating energy efficiency into your operations delivers benefits that reach far beyond your energy bill. Improvement of thermal performance of a building envelope through measures such as increased insulation, installation of high performance windows and frames, low emissive window glazing or low emissive roof barriers. Implementation of new operating procedures, including the purchase and installation of equipment (such as an energy management system, building automation systems, sensors, control equipment, metering equipment, or related communication systems) necessary either to obtain or to increase the effectiveness of an energy management system or building automation system. The Buildings Program offers financial assistance to implement energy efficiency measures while carrying out projects in commercial or institutional buildings. The Government of Saskatchewan with its goGreen program is committed to finding solutions to the environmental challenges facing our province, our country and our planet. Due to our reliance on coal, natural gas and other fossil fuels, Saskatchewan has a high greenhouse gas emissions rate. To sustain the province's natural resources and maintain a good quality of life for residents and generations to come, the provincial government is committed to finding a balance between growth and environmental protection - encouraging residents, communities and businesses to reduce their carbon footprint in their day-to-day lives. 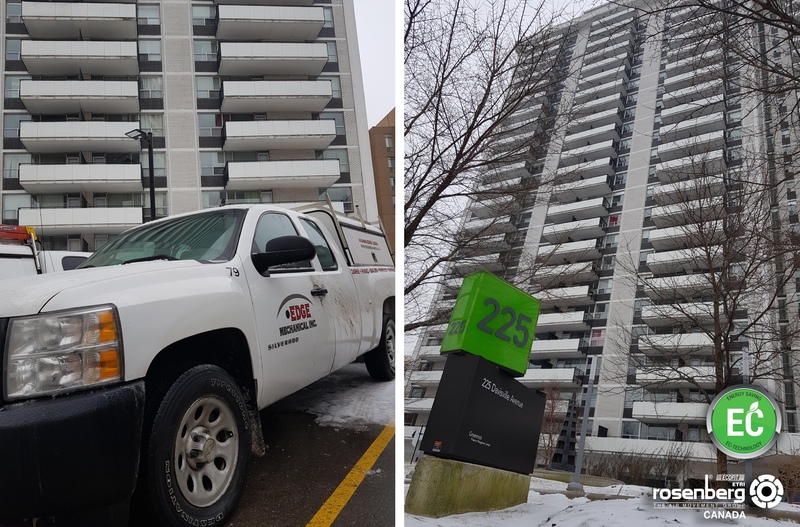 Manitoba Hydro with its Power Smart Program has saved a total of $150 million on the energy bills to its customers since the introduction. This Demand Side Management initiative not only saves money, it also allows them to export their renewable energy to other provinces and states that rely on fossil fuels. Power Smart Program will help their customers save on bills, help meet the future energy needs of Manitobans, build Manitoba’s green economy, and help the environment. In most businesses, heating, ventilation, and cooling typically account for 40 to 60 per cent of energy costs. A great way to reduce energy consumption and offset rising fuel costs is to replace old, inefficient equipment with energy efficient technologies. Financial incentives help offset the added cost of efficiency upgrades and reduce the payback in energy savings to just a few years or less. The maximum eligible incentives are $250,000 for all electrical measures and $100,000 for all natural gas measures included in the project. Lower energy bills and reduced maintenance and overall operating costs. Improved work environment with more uniform temperatures throughout your building. Increased comfort translates into greater productivity. Improved marketability of your building. Value is added by improving comfort and reducing operating costs. Commitment to a sustainable future by reducing greenhouse gas emissions. Get money back when you invest in energy efficient upgrades in heating and cooling, refrigeration, lighting and controls, and more. You can also get money back when you reduce demand. The Power NB's Retrofit Program provides financial incentives of up to $3,000 towards an evaluation to determine the potential for energy efficiency upgrades in a commercial building and a maximum of $75,000 towards the energy retrofitting project costs that result in measurable electricity savings. In order to qualify for incentives, please ensure your Energy Management Service Provider has met, and will meet, the Energy Smart Program requirements. Efficiency Nova Scotia with its Building Optimization Program gives your aging building the tune up it needs. Imagine returning your older building to its original glory: running at peak performance, saving up to 15% on energy bills and making everyone inside more comfortable. Nova Scotia Power with its Commercial energy solutions can help your business save money and energy by using efficient HVAC (Heating, Ventilation and Air Conditioning) equipment. Making changes to your commercial HVAC system can be a complex decision but also a very rewarding one. Saving money, improving efficiency, reducing emissions and enhancing employee/customer experience are all potential benefits of a system upgrade. Along with heat pumps, there are many other options available to help you improve your commercial space. 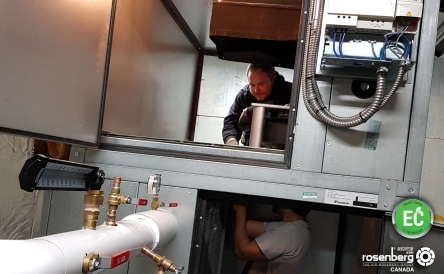 Nova Scotia Power can connect you with one of their approved commercial HVAC contractors, provide options for financing, and help you understand all of the available solutions. 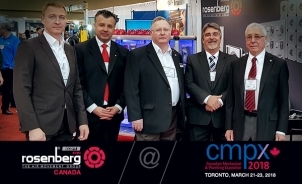 Rosenberg Fans Canada Ltd. is launching a unique concept that contemplates all the elements needed when thinking on retrofitting old coupled through belts or other inefficient types of fans to outdated non-premium motors. 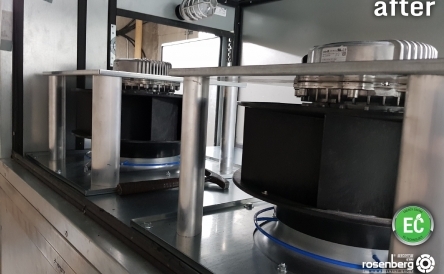 We have the only solution that allows efficient external rotor EC motors fans (ECM) to be mounted directly to the plenum. An old belt-driven 10 HP fan has been replaced by two of Rosenberg's quiet and energy-efficient EC (ECM) fans. Our very efficient composite "E”-wheel impellers were used in this project. Description of Rosenberg's impellers can be found here. The speed is controlled with a simple potentiometer provisionally. 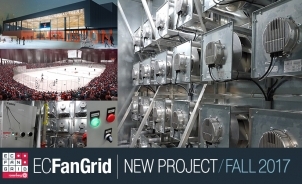 The final upgrade will include automation and communication with the building management system using the analog and digital communication ports that are integrated into each of Rosenberg’s EC fans. Flyer: ECFanGrid. 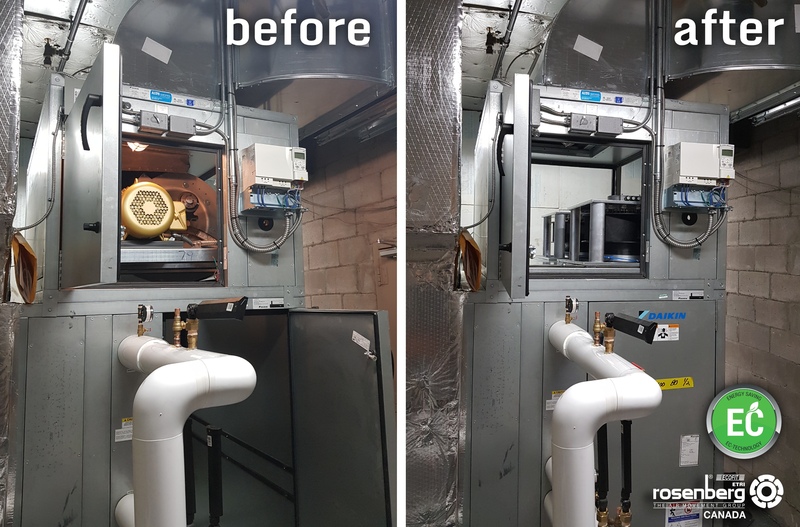 Upgrade your AHU and save. Thanks to those of you who stopped by our booth at the CMPX-2018 in Toronto! We were pleased meeting you and to have a chance to offer you our products, services, and solutions. Click Read More to check out the Video from the event. 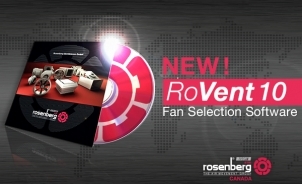 Introducing RoVent 10: our revamped and improved Fan Selection Software. All new RoVent 10 ! Robust and intuitive, it delivers much more data, more efficiently. Click "Read more" for step-by-step Tutorials and Download link. 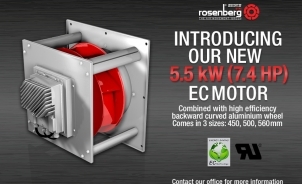 Rosenberg Fans Canada is Introducing our new 5.5kW / 7.4 h.p. EC Motor (ECM) combined with high efficiency backward curved aluminium wheel.